10/2010-03/2011: Study „The Demographic Change and its Consequences for the City of Hann. Münden” (Der Demographische Wandel in Hann. Münden und seine Auswirkungen). On behalf of the Municipality of Hann. Münden/Germany – Department of Urban Planning (im Auftrag des Fachdienstes Stadtplanung der Stadt Hann. Münden). 01/2009-12/2009: Study „The Demographic Change within the Administrative District of Göttingen – Population Prognosis 2025″ (Demographischer Wandel im Landkreis Göttingen – Prognose 2025). On behalf of the the Administrative District of Göttingen/Germany – Office of Planning, Building & Housing (Projektstudie im Auftrag des Landkreis Göttingen, Amt für Planen, Bauen und Wohnen). 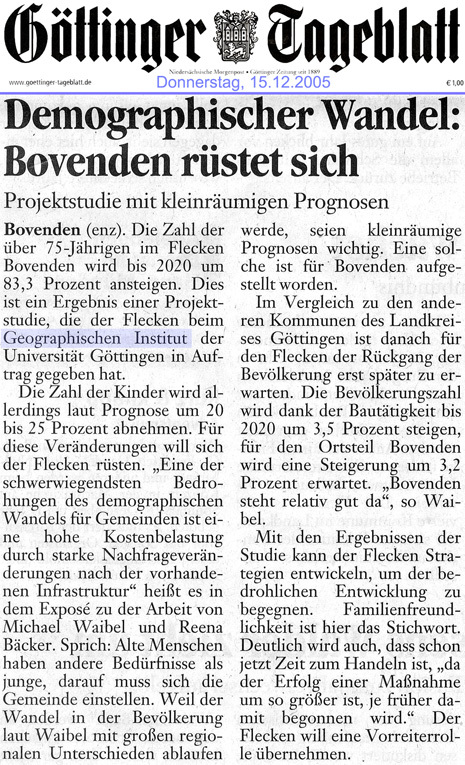 10/2006-2/2007 Study „The Future Demographic Change in the commune of Gieboldehausen and its Consequences for Communal Planning and the Supply of Social Infrastructure” (Der demographische Wandel und seine Auswirkungen auf die Samtgemeinde Gieboldehausen). On behalf of the community SG Gieboldehausen/administrative district of Göttingen. 9/2006-1/2007 Study „The Future Demographic Change in the commune of Friedland and its Consequences for Communal Planning and the Supply of Social Infrastructure. On behalf of the community Friedland/administrative district of Göttingen. 10/2006-1/2007 Study „The Future Demographic Change in the commune of Rosdorf and its Consequences for Communal Planning and the Supply of Social Infrastructure. On behalf of the community Rosdorf/administrative district of Göttingen. 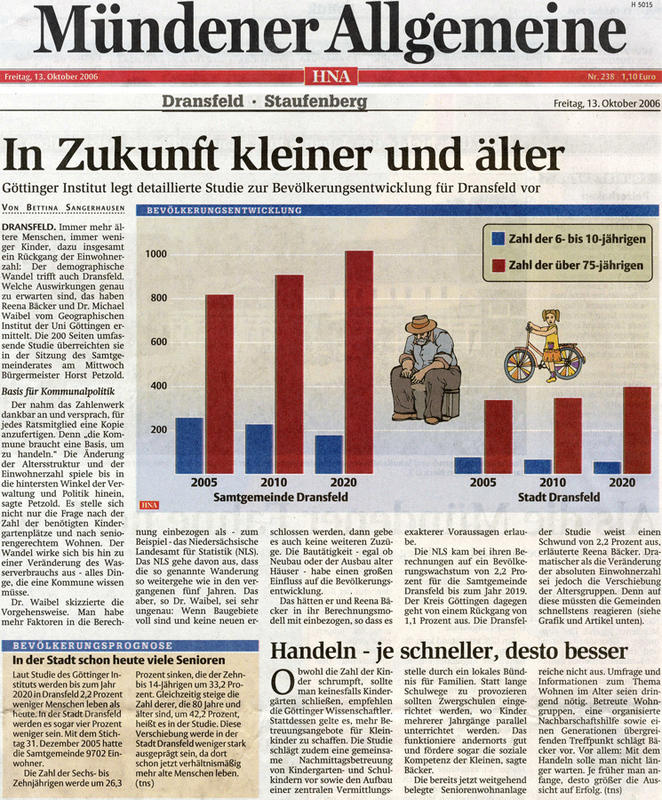 5/2006-8/2006 Study „The Future Demographic Change in the commune of Dransfeld and its Consequences for Communal Planning and the Supply of Social Infrastructure. On behalf of the community SG Dransfeld/administrative district of Göttingen. Press Review HNA – Mündener Allgemeine 13 October 2006: In Zukunft kleiner und älter – Göttinger Institut legt detaillierte Studie zur Bevölkerungsentwicklung für Dransfeld vor. 3/2006-6/2006 Study „The Future Demographic Change in the commune of Radolfshausen and its Consequences for Communal Planning and the Supply of Social Infrastructure. On behalf of the community SG Radolfshausen/administrative district of Göttingen. 6/2005-11/2005 Study „The Future Demographic Change in the commune of Bovenden and its Consequences for Communal Planning and the Supply of Social Infrastructure. On behalf of the community Bovenden/administrative district of Göttingen. 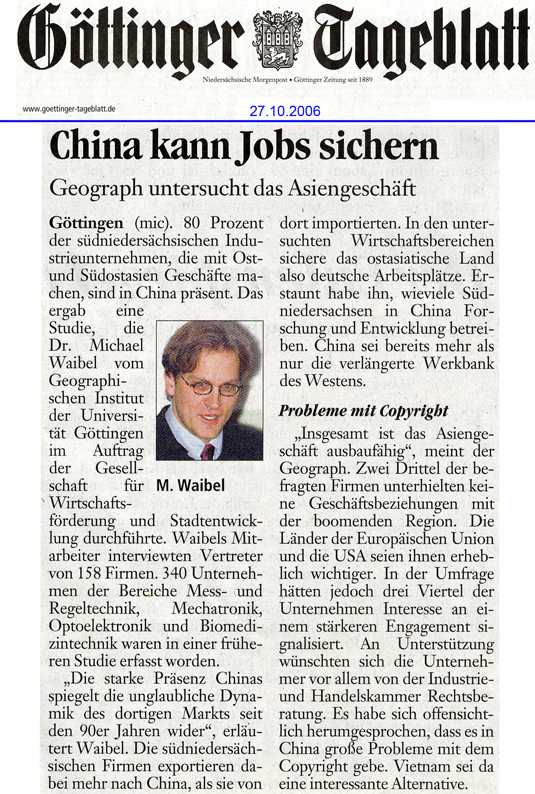 Press Review Göttinger Tageblatt 15 November 2005 Demographischer Wandel: Bovenden rüstet sich. 10/03-04/04, Study on the “Acceptance and Evalution of the inner city of Bad Gandersheim by patients of the Paracelsus Hospitals” (Akzeptanz, Nutzung und Bewertung der Bad Gandersheimer Innenstadt von Patienten der Paracelsus Kliniken). On the behalf of the municipal administration of Bad Gandersheim. 10/2002-2/2003, Study on the economic potential of the weekly market of Göttingen; survey among visitors and suppliers. On behalf of the municipal administration of Göttingen City. 10/2001-2/2002, Study on the economic potential of the Christmas market of Göttingen City; survey among visitors and suppliers. On behalf of the municipal administration of Göttingen City and the Guild’s Association of the Christmas Market.